Hear that beautiful sound wafting in on the westerly winds? 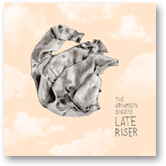 That's likely the sounds of Late Riser, the forthcoming sophomore album from Vancouver folk outfit The Abramson Singers (out May 14th). Vocals harmonies abound on the record, centered around the group's mastermind and namesake Leah Abramson. On "Liftoff Canon" it's a multi-voice affair, with each one singing a different part. The lead single "Jack of Diamonds" sees Abramson's lovely vocals set to and easy, breezy arrangement. Anyone who is a fan of fellow Canadians Dala should love spending time with The Abramson Singers. The soft melodic folk of tunes like "Fight or Flight" and "Drowning Man" should feel familiar. Much like Dala, Abramson manages to be sullen without being depressing on "Deja Vu". Some pop elements creep in. The peppy "Lose-Lose" sees Abramson doing a pretty good Zooey Deschanel impression. The drifting closer "Red River Valley" becomes one of the catchiest tunes on the record as the soothing choral vocals come in to round it out. Folk fans should embrace Late Riser without trepidation. It's a strong record from start to finish, and one which avoids many of the pitfalls that plague traditional folk music. Best tracks: "Red River Valley", "Lose-Lose"